You may know of the Minden Bog, a huge peat wetland in northern Sanilac County, covering about 5,000 acres or nearly 8 square miles southwest of Minden City and west of Palms. The Minden Bog is a major part of the headwaters of the Black and Cass Rivers, a wetland complex that probably once covered over 30 square miles. Roughly a third of the bog is within the Minden City State Game Area. The Minden Bog is so big it shows up as a dark area on satellite photography of Michigan. Few know what actually makes the Minden Bog so unique and valuable. Bogs, and other peatlands such as fens, muskegs, heath, mire, and moors contain peat, a dark brown to black soil formed entirely of partially decomposed plants, mostly sedges. Some peat is also composed of decayed mosses, especially of the genus Sphagnum, thus the term "peatmoss". Peat is the primary ingredient of potting soil sold at most stores. It is valued for its tremendous water-holding capacity, its lightness, and as a sterile growing medium for starting seeds. Peat, and its non-fibrous cousin, muck, contain large amounts of carbon which gives it a charcoal black color. In fact, coal forms from peat. It is estimated that about one-quarter of the world's soil carbon is contained in peatlands. Peat normally accumulates where plant material decomposes very slowly, usually in water where oxygen is low, which limits the microorganisms that break down dead plants. Decomposition in the absence of oxygen tends to create acid by-products, which further limits the breakdown of plant material. Large and deep peatlands are more common in northern latitudes like Canada, Russia, and northern Europe, where it is cooler, which limits evapotranspiration (evaporation plus the release of water to the air by plants), leaving the ground wetter. Also, in cooler regions, the microorganisms that break down plants are not as active, and have a shorter season to do their work. Peatlands form in one of two ways, either by terrestrialization, the infilling of a lake with peat-forming plant material, or by paludification, the gradual formation of peat across poorly drained, gently sloping or nearly flat land. The term "paludification" comes from the Latin word "palus", meaning "swamp", and so means "a process of swamping". What makes bogs different from other peatlands is that they are acidic, and the peat is elevated above the groundwater and surface water within them. Unlike fens and other wetlands, bogs are largely isolated from water inflow from the surrounding landscape, which contains relatively large amounts of dissolved minerals and tends to be slightly alkaline. The bog surface becomes isolated when the peat builds up above the prevailing groundwater. Bogs are described as ombrotrophic or "cloud-fed", receiving water from precipitation alone, which tends to be slightly acidic to start with. Fens are similar to bogs, but are described as minerotrophic, or "mineral-fed". The lack of mineral-laden groundwater, the decomposition of water-saturated plant material, and the acid released by mosses on the surface, all cause bogs to become acidified. Sphagnum mosses have a high water-holding capacity due to an intricate fibrous network of living and dead leaf cells. The walls of the larger dead cells, or "hyaline" cells, contain high concentrations of acids, allowing the moss to absorb the few nutrients available in the bog by exchanging plentiful hydrogen ions for them, which makes the soil and water acidic. As peat continues to accumulate on some bogs, the center becomes higher and forms what is called a "raised bog". The cross-section of a raised bog looks more or less like a dome. This normally happens only in sub-arctic regions like Canada, or cool oceanic climates like Maine or Ireland, where peat formation is favored. The Minden Bog is a raised bog. The dome shape is evident from topographic maps, with the top of the dome about 6 to 10 feet higher than the rest of the bog. The top is at about 790 feet above sea level, over 200 feet above Lake Huron. While it is not unusual that some peat and muck formed in the wet areas of the Thumb, it is very unusual that an area as large as Minden Bog did, and especially that it is a raised bog, which normally occur north of the Great Lakes region. Minden Bog is one of only two or three southern-most raised bogs in North America and the only one left in Michigan. Two other sites in the Thumb, the Sandusky Bog and Imlay City Bog, were raised bogs before they were extensively mined. It has been suggested that parts of the Thumb may have a somewhat oceanic-like climate due to the proximity of Lake Huron and Saginaw Bay, and together with a cooler growing season, may partially account for the formation of raised bogs. Minden Bog most likely developed through paludification in a large, shallow, nearly flat glacial drainageway called the Ubly Channel, which runs northeast from Carsonville and McGregor up to Ubly, then turns southwest toward Cass City. Roughly 13,000 years ago, glacial ice readvanced and then stopped, leaving the Port Huron Moraine at its southern limit, a large ridge of glacial deposits running north from Port Huron, just east of Palms, and continuing around the Thumb and Saginaw Bay into northern Michigan. Glacial lake waters drained through the Ubly Channel, along the west side of the Port Huron Moraine, to what was Lake Saginaw, and down the glacial Grand River to Lake Chicago, essentially the southern half of Lake Michigan, and finally out the Mississippi River. Peat formation in the Ubly Channel may have started about 12,000 years ago, probably in the lowest parts, in small depressions or ponds. Peat would have continued to build-up and spread by paludification along the channel bottom for thousands of years until the earliest bog conditions developed. About 6,000 years ago, Michigan's climate appears to have become wetter and cooler, which favored Sphagnum moss growth and added even more peat, which continues today in the unmined parts of Minden Bog. 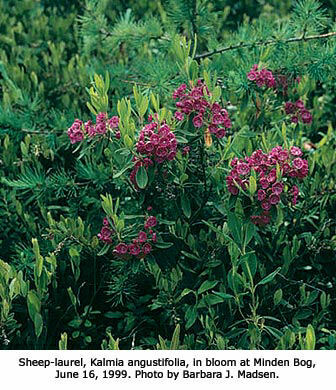 Minden Bog is covered by low shrubs of the Heath Family like Leatherleaf, Bog-laurel, Sheep-laurel, Labrador-tea, and three Blueberry species. Both Large and Small Cranberry grow there also. 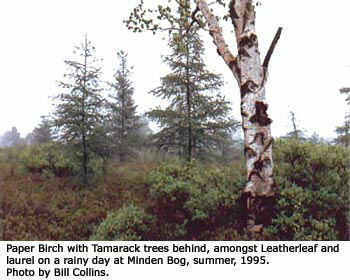 Bog Birch is fairly common. There are only a few scattered trees, mostly Paper Birch and Tamarack, but a few spots are dry enough to support Jack Pine. Underfoot is a thick, soft carpet of mostly Sphagnum mosses, although at least 12 species of moss have been found. Sphagnum rubellum, an Atlantic coast moss, grows in Minden Bog, far out of its usual range. Species like Jack Pine, Labrador-tea, Sheep-laurel, Eriophorum angustifolium, a Cotton-grass species, and Stellaria calycantha, a northern Chickweed species, are at or near their southern limit in Michigan, reflecting the northern character of Minden Bog. Standing in the midst of the bog on a misty overcast day can give the feeling of some ancient European legend. On a bright sunny day, the bog is a kind of monotonous green alien desert. But, if one looks more closely, the bog reveals one surprise after another, like vivid pink blooms of laurel, puffs of Cotton-grass, blueberries, cranberries, and complex moss structures. Few species are adapted to thrive in the acidic, low-nutrient bog environment, but insectivorous plants like Sundew, which grows in Minden Bog, supplements its diet with insects, captured and digested on sticky tentacle-like leaf parts. Minden Bog is probably most well-known as a popular White-tailed Deer hunting area and blueberry picking area. The bog is also the only location in the Thumb for Snowshoe Hares, again, indicating its northern character. The bog provides habitat for Ruffed Grouse, which feed on the blueberries, and for Woodcock. Minden Bog is the southernmost station for Lincoln's Sparrow, a species whose next closest breeding site is about 100 miles to the northwest up near Roscommon and Mio. I would like to thank Dr. Barbara J. Madsen, Associate Curator of Botany at the Cranbrook Institute of Science in Bloomfield Hills, Michigan and Adjunct Assistant Professor with the University of Michigan Biological Station for providing much of the technical information regarding peatlands and Minden Bog, and for her continued advocacy on behalf of significant natural areas across Michigan.